The unparalled feature of Calypso is its ability to layout the pages in such way, that it dynamically overlays the pages as needed. Thus, if you are playing near the bottom of a page, the next page is already there. There is a moving 'spot' which shows the position, where you are presumably playing at the moment. If your current mood lets you play a bit faster or slower, that doesn't matter; Calypso shows you enough bars in front and behind this spot. By tapping on a bar during a short pause of your performance, the spot jumps to that tapped bar. The layout will instantly adapt to that actual playing position and Calypso even adjusts the tempo to coincide with your current mood. 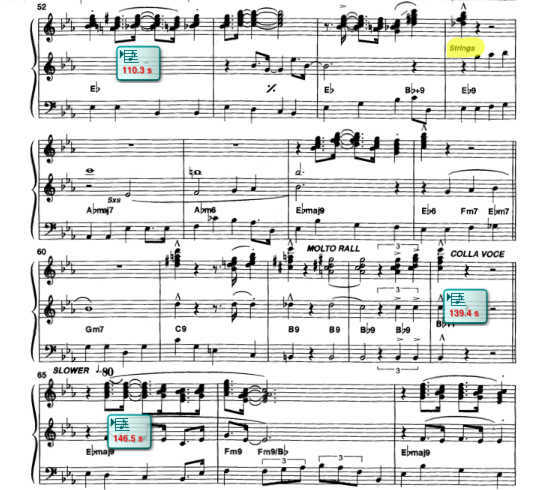 When you prepare a song, you tap on each bar in the score and Calypso numbers these bars. After assigning the bars you can tell Calypso the jumps within the songs by first tapping on the source bar of the jump followed by the destination bar. You can assign a repetition count to each jump. 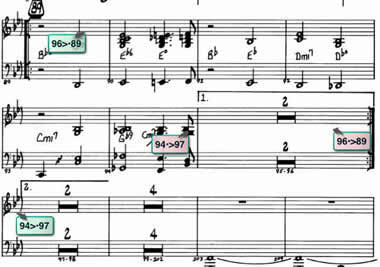 For jazz musicians there is also an option 'on cue' for open solos. 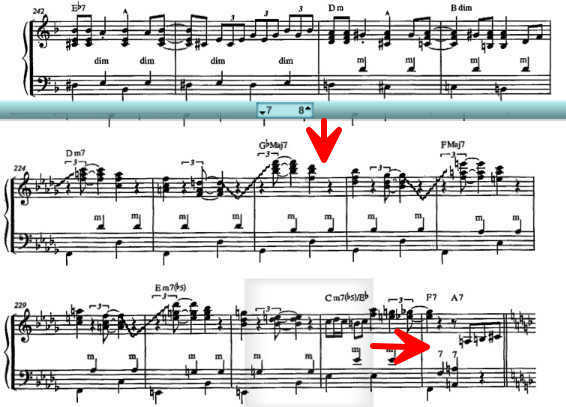 You can assign a repetition count to a bar, mostly used in an orchestra for long pauses. And finally you also may enter tempo changes. With thus prepared songs Calypso knows the complete structure of the song: when to repeat from ending 1. When to jump to ending 2 or ending 3. When to jump back to the Segno or to jump ahead to the Coda. Where is the 'Fine'. 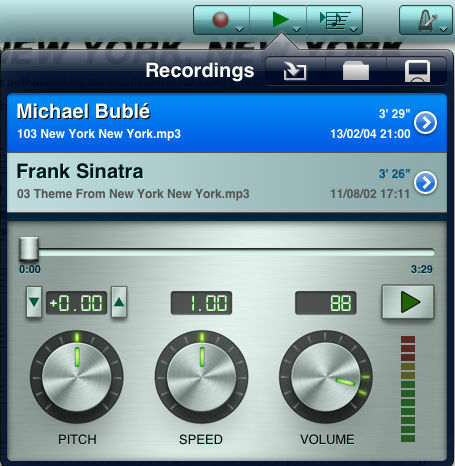 Tap the record button and record your practising or your gig. This is fun for your little daughter, when she can play her exercises to her teacher. Or assign tunes from your iPod library or a mp3 out of your Dropbox or iCloud to your song. You can change the pitch and/or the playback speed in wide ranges. If a tune is in a 'strange' key or tempo, it doesn't matter anymore. You can easily synchronize an assigned tune with the score: just start the song with the audio playback and the sync button switched to ON. Listen to the music and occasionally tap on the bar you currently hear. When you then start a song by double tapping a bar with audio playback switched ON, the audio will also start at that bar. The 'spot' will advance in sync with the audio. By tapping any bar, the spot will jump to that bar and the audio will also do so! Those synchronized recordings will be of great help, whether you want to practice with play-a-longs, learn a jazz transcription or want to follow Rubinstein's interpretations. 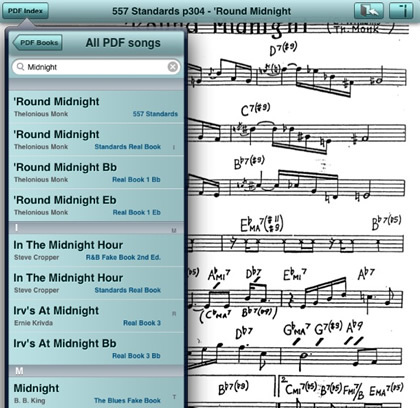 Organize your songs in songbooks - or call it bandbooks. Name them and assign an eye catching cover to them. 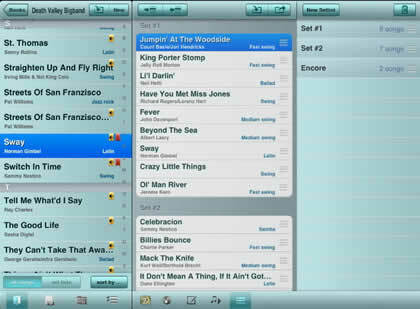 The setlist editor gives you the best overview to prepare your gig. With the songlist on the left, the sets on the right and the setlist in the middle you have all you need on one screen. Name your sets and rearrange the songs and/or your sets. Export your setlists to your bandmates as an importable file for other Calypso users or as plain text within a mail. For those who are in Jazz, Calypso knows more than 25 of the most commonly used fakebooks. If you have some of those fakebooks, you can scan them and make pdf files of them. But there are also very helpful sources in the net, where you can get a copy of your books. You may also buy and download legal copies elsewhere. Just search the web. 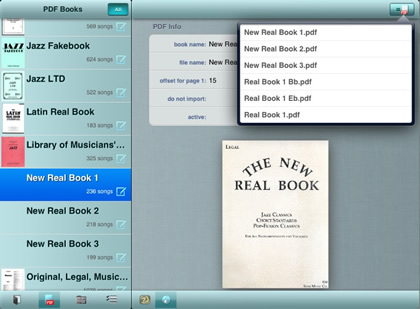 Copy the fakebook pdf into the documents folder of Calypso. Then simply assign it to a fakebook index as shown in the above screenshot. After you have your songbooks included into Calypso, you can browse and search for songs within just one or all of your fakebooks. 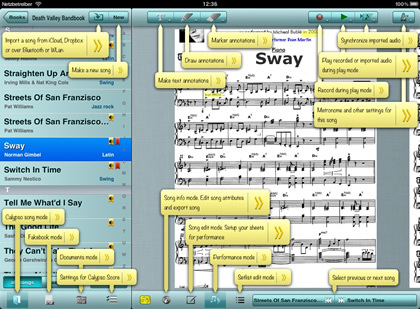 Or sort your songs by composer. You are always best prepared for any session. You can export all the content of Calypso and share it with other users - your bandmates or the public (on the forum here). Share songs (with or without synced mp3), setlists (with or without the songs), complete songbooks or just the audio file of your practising.